Rent The Stillwell House and Garden | Corporate Events | Wedding Locations, Event Spaces and Party Venues. Welcome to the Stillwell House and Garden - your historic wedding and event destination. 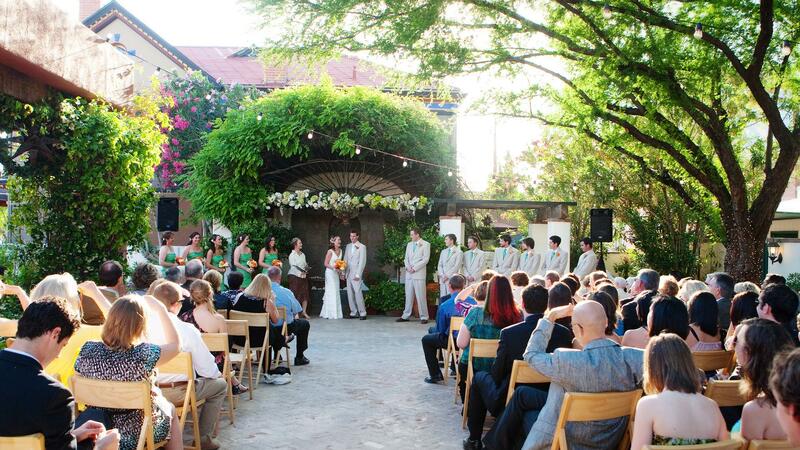 As one of Tucson’s authentic historical landmarks, The Stillwell House and Garden provides an elegant, historic unique setting for any time of the day, steeped in rich tradition and ceremony. With the beautiful and private setting..
of The Stillwell House and Garden and its unique uses and versatility for special occasions, combined with the knowledge, expertise and top-notch cuisine, we offer a variety of daytime and nighttime events. From classic garden bistro brunches by the fountain to elegant candle lit evenings, we can help you customize your event. Please enjoy your tour of The Stillwell House and Garden; we look forward to helping you create your perfect celebration. to fit any budget, taste and style. Valet parking and many affiliated services and vendors are available for your event. Weddings and events can be held year round, and we can accommodate up to 350 guests throughout the property. We also provide discounts for off-peak months, Friday, Sundays, and weekday celebrations. You can schedule a complimentary tour and consultation where you can view the property and receive a personalized event quote.